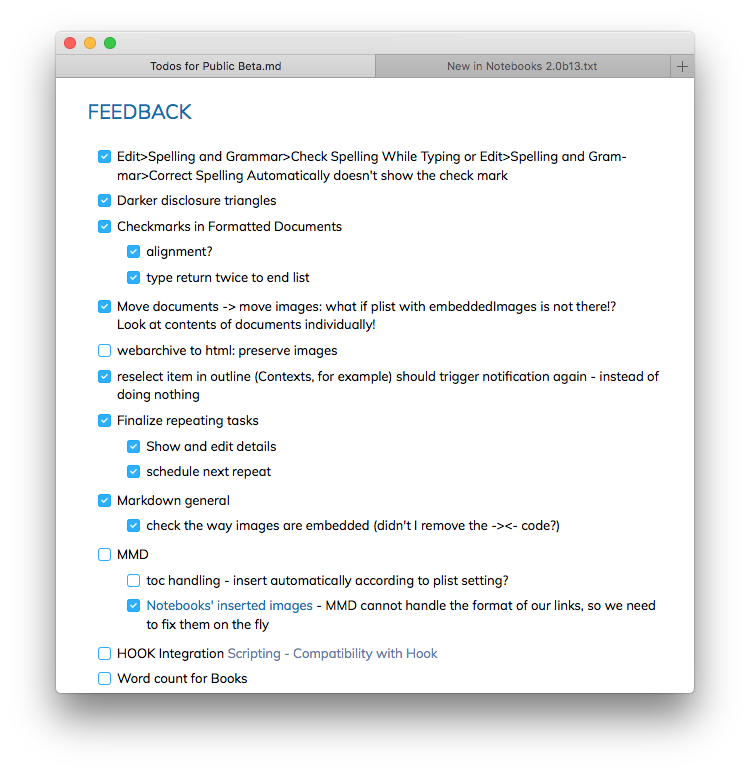 We just uploaded an update of Notebooks for Mac Public Beta. It contains numerous additions and improvements, and while a few topics are still missing for the final release, we feel that we are getting close. Redesigned interactive checkboxes which much better integrate with formatted documents especially. Improved drag & drop reordering in outline. The full list of changes and additions is available from the in-app help in Notebooks for Mac Beta 13. Those of you who are using Beta 12 will be automatically notified about the update, all others can grab a copy of Notebooks for Mac Beta 13 right here. As someone who sometimes likes to use the number sign in documents (like #2, #3), it might be helpful if there was a way to set contexts to only look for tags that begin with the @ sign — I often have to go back into a document and add a space between the # and the number after I see a weird number tag in the contexts. We are planning to make these characters customizable, so user get full control over their context tags. The PDF situation is the biggie from where I’m sitting, but that will be user-dependent, I expect.